Today I am working on a project for tomorrow's post that is requiring me to clean off my desk. I know, pretty radical, huh! I am very tempted to just take my arm and sweep it all into a big basket. Although that might work for some photo taking, it is not going to solve the continuing problem I have with a very small work space. 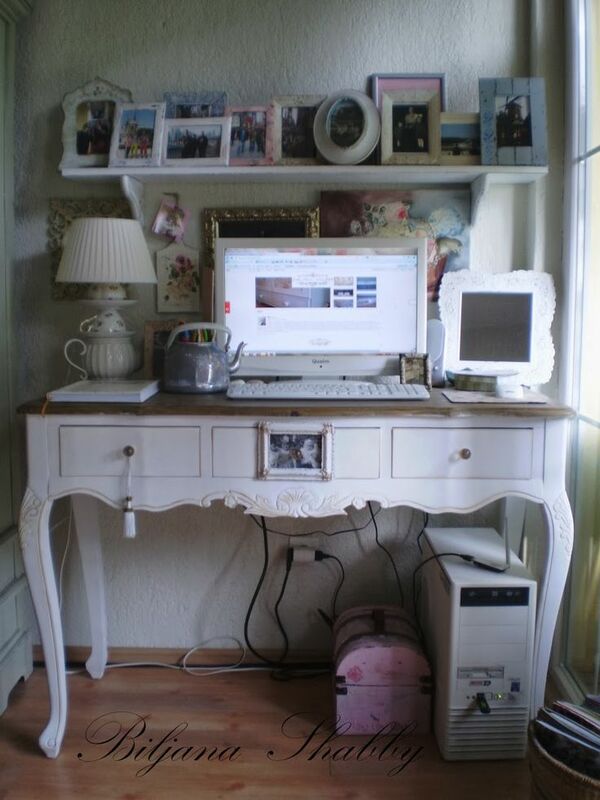 I know that I can't get it done immediately, but I have been looking at what other people have done with their small home office spaces. 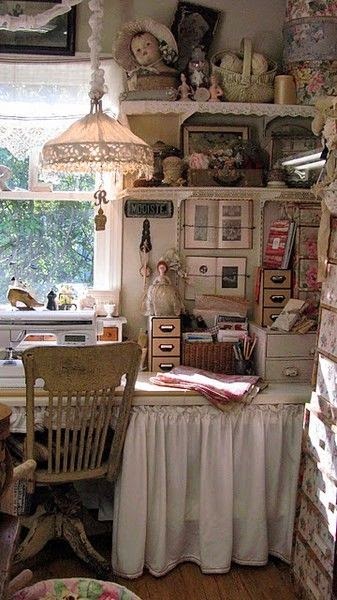 I love this little space. It is definitely something that would fit in with my decor. 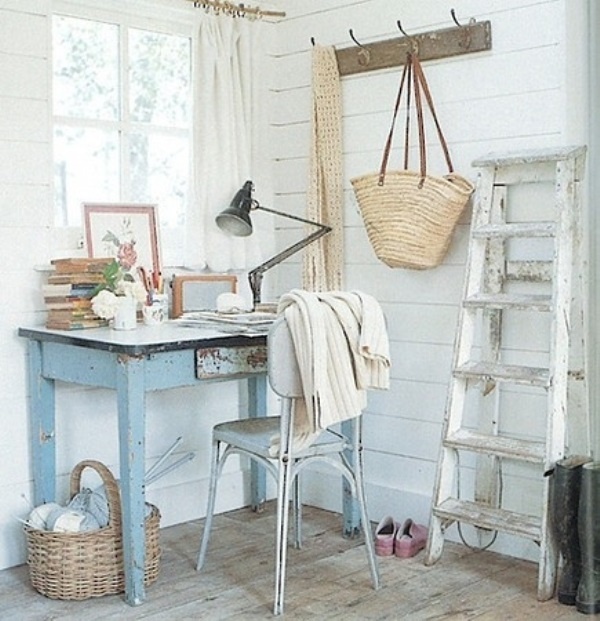 I love the sweet cottage feel of this little space, but still no solutions for storage. Where do these people put all of their bits and bobs? This is a great organizing solution. If I just had a bit more space. I could definitely live with this. Now If I could just talk the apartment complex and my neighbors into letting me break through a wall to give me more space. Oh well, back to the drawing board cleaning and purging. Photos and their original sources can be found here. 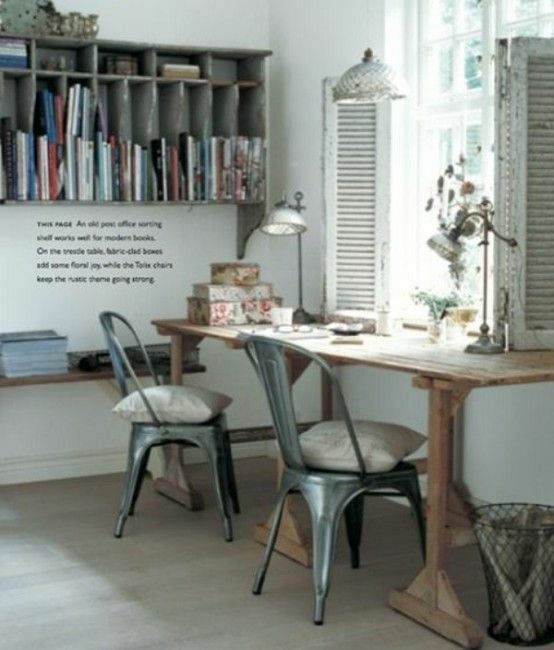 These are some very pretty work spaces and I'd love to be that organized and well decorated. Actually, my 'office' is the dining room table. Hubby's office is the one that really needs the work of purging and cleaning. Good thing I don't spend time in his office! :) Have fun purging. Time, money, and space are definitely not my friends at the moment, Pamela. As my little space is in my bedroom I can't close the door on it. 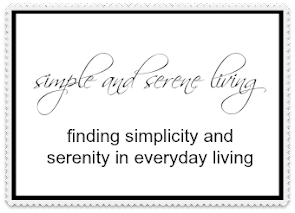 That means looking at it constantly, which I am tired of doing. 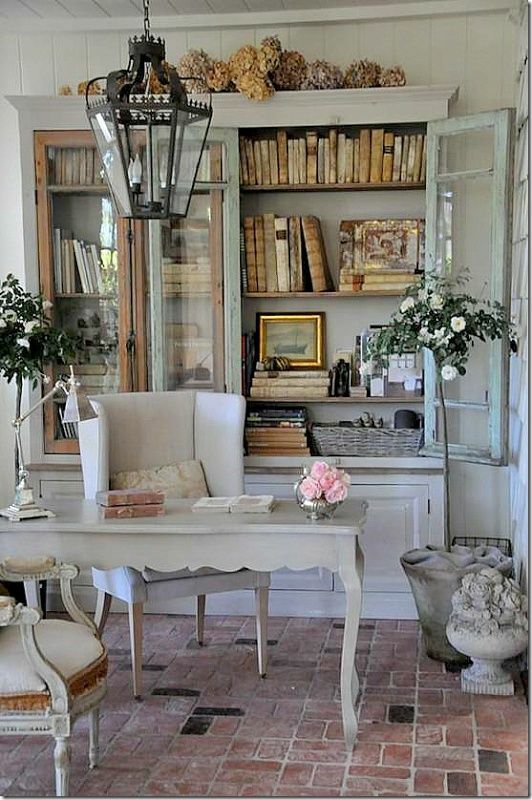 So pretty and so very well organized spaces, such lovely ideas...swoonnnn...Wish I could do something like that in the guest room, but need to rebunk it first! My office is my breakfast room in the meantime, lol! There never seems to be enough space, does there? I am a person who loves a bit of clutter at my desk. Both at home and at work! I have the exact same problem... My desk is burried under so many paper you can't see it... I know I must do something about it... But I just don't feel like it! I pinned some of your pictures, maybe that'll encourage me!